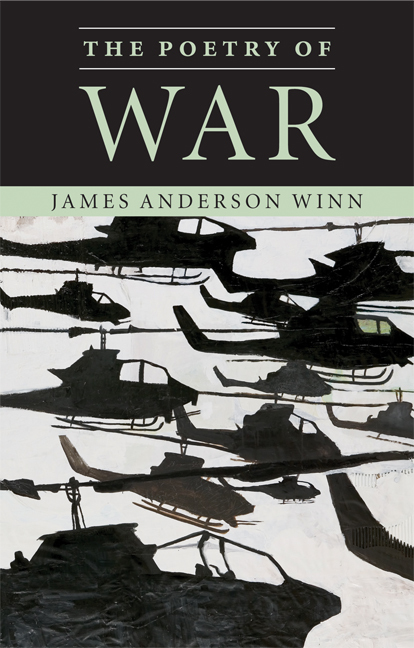 While war may rob and subvert language, simplifying the grandest of catastrophes, the political realm can rob poetry of its soul, hijacking poetic language for its own gains. James Winn, author of The Poetry of War shows us how poets strike back. If you haven’t caught it yet, read Winn’s article in The Chronicle of Higher Education. There’s a link on his site. Speaking as rapidly as he drinks, cummings’s blowhard orator does not bother to finish any of the scraps of patriotic verse he quotes. Fragmented and disjointed, the phrases from national hymns that he slaps together have no more meaning than the bywords that end the recitation: “by gorry / by jingo by gee by gosh by gum.” Although cummings has cunningly shaped the speaker’s regurgitated fragments into a perfectly rhymed Petrarchan sonnet, most of the rhyming words come in the middle of phrases. The formal order clashes with the urgent but pointless rhetorical order of the speech. By treating words as if they were only sounds, cummings expresses his contempt for conventional patriotism, his belief that its formulas are now empty of meaning. There is a touching message in this odd-looking line. Politicians and orators may destroy the meaning of language, but poets, even as they record and mock that destruction of meaning, may still contrive to carve their initials into the otherwise meaningless surface. To do so is an assertion of freedom—not the grand, collective Liberty celebrated in empty and dishonest political speeches, but the simple, personal freedom to be, to speak, to make a mark. e. e. cummings, “next to of course god america i” in Complete Poems, 1904–1962 (New York: Liveright, 1994), 267.